Ok, health care reform finally passed. Finally. You might feel like it’s the Rapture, where all believers are caught up together with Obama in the clouds. Or you might feel like the bill slyly provided for the populace to be outfitted with the Mark of the Beast. But on all sides, the response has certainly been of Biblical proportions. But is all the clamor justified? How much is really going to change? Well, the bill certainly shakes up an area of litigation that is already pretty hot: insurance claims. Insurance companies often try to save money by refusing to pay otherwise valid claims to their undersigned. This often is seen as worth the risk of being sued, since many people experiencing a crisis do not have time to fight a legal battle with an insurance company. Health care providers have sometimes done this, and will likely continue to do so in the future because the economic incentives are there. Health care companies are businesses, and after all, businesses are in business to make money. There are two main legal theories an insurance holder can pursue when they are cheated like this. First, they can allege bad faith. Bad faith is a general term that is used when a party acts with some sort of intent to cheat another party in a commercial setting. It’s safe to say that even after health care reform, courts are going to continue to punish people for being dishonest with others. The other theory, however, looks like it might change substantially. An insurance claimant can also hold the insurance company accountable for the policy in contract. The longstanding legal principle is that when both parties are free to enter into a contract or decline it, then they should be held legally accountable for their end of the agreement. By putting aside things like punitive damages that can be awarded for bad faith, a claimant may find it easier to prove contract damages. This is often done when the size of the actual claim is large, and thus bad faith damages are relatively too small to fight over. One small catch is that insurance companies can file counter-claims here against those that have come short on their end of contracts, or otherwise cannot approach the suit free of wrong themselves. But overall, this is considered a somewhat easier way for an insurance claim to prevail. As was mentioned above however, a contract theory assumes basically equal footing of the parties and the freedom of each one to accept or deny the contract. It is thought that in order to have an orderly free market economy, people should be able to choose between alternatives in a business setting. This is referred to as freedom of contract. This concept was shot to pieces on both angles by the health care reform bill. Most importantly, insurance companies in 2014 will no longer be able to deny coverage to those with pre-existing conditions. This was touted as a major goal of the reform, because it is a tragedy when insurance companies turn down someone who is sick for being too expensive to cover. However, there could be legal problems as the government interferes with a company’s freedom to contract with whomever they choose. For example, consider someone who is young and relatively healthy. They may go without health insurance until they develop some easily treated condition, such as a cavity that needs to be filled. They may then drop coverage immediately after their new insurance foots the bill, having paid very little for the short term policy. Since the insurance companies are legally bound to insure them, the only thing that they could do would be to increase premiums. However, even this is uncertain since health care providers are now restricted in their ability to increase premiums for a specific class of persons. At best, this will balloon costs across the board. At worst, this will weaken any legitimate cause of action against insurance companies in contract, since after their freedom to transact was deprived by government action, it looks a lot less like a contract as we understand it. On the other side of the contract, there are also problems for claimants who have previously gone prolonged periods without health care coverage. For the first time ever, the government has made moves to fine those who do not have health insurance. And it’s done so in a curious way. Instead of paying a ticket for violating a misdemeanor statute, like you would if you didn’t have car insurance for example, you’ll instead be assessed a penalty when you file taxes after 2014. This makes the IRS the agency primarily responsible for enforcement of the statutory mandate, which is a strange police role for the agency to take. The desired effect, presumably, is to remove the suggestion of wrong doing when someone refuses to buy health coverage like the law requires. So far, the government has tried to show some amount of respect for the individual’s freedom to weigh the economic benefits, and simply appears as an innocent attempt to balance the scales a bit in one direction. But despite this very technical distinction, statutory violations have often been used as the basis for why a contract should be held unenforceable. The health care bill itself even suggests a tightening of this mandate, which might even make the denial of health care coverage a crime in the future. There may come a day where exercising freedom to decline health coverage is a wrong of equal magnitude as endangering other motorists by driving without auto insurance. In the case of vehicle insurance at least, companies can use this as a basis not to insure you. It’s not inconceivable that insurance companies would even use the decision not to purchase health care coverage in violation of statute as evidence of bad faith or “unclean hands”. 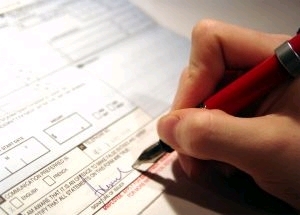 Insurance claims cases are often denied because the undersigned did something as minor as making a payment late. Imagine the wrong of exercising freedom from the health care regime! Insurance companies will certainly look into this to see if it’s yet another avenue they can pursue to deny claims. So on the one hand, there are huge new incentives for people to go uninsured, and on the other, the penalties for so doing may include the denial of future claims. The economics are so sensitive that something unforeseen may happen, and as always, it will be the legal system that finally has to sort the whole mess out.